Have you been wanting one of the SurLaLune Fairy Tale tomes but have been stopped by the price? Well, you can get one of the books for up to 30% off ($10 limit) with a rare Amazon coupon code. And of course, it doesn't have to be a SurLaLune Fairy Tales title--you can use the coupon on any book for sale by Amazon, no third party sellers included in the coupon. Really, use this coupon because I don't remember ever seeing one like this on Amazon before. It doesn't have to be on a SurLaLune title, obviously. I already own the SurLaLune titles so I'm going through my wishlist looking for a book in the $30+ range to use this coupon on. Take an extra 30% off any book offered by Amazon.com from now until December 1st. Enter code BOOKDEAL at checkout. Here's how (restrictions apply). Here's how. Today is another serpent beast in an ATU 425C Beauty and the Beast tale. This time the tale is from China and is titled, "The Fairy Serpent." I think this is the last of the snakes in ATU 425C found in Beauty and the Beast Tales From Around the World , unless I have forgotten to post about one. I will have to double check, but as you can see, if the beast is not a beast/monster, it is most often a snake/serpent in these tales. ONCE there was a man who had three daughters, of whom he was devotedly fond. They were skillful in embroidery, and every day on his way home from work he gathered some flowers for them to use as patterns. One day when he found no flowers along his route homeward he went into the woods to look for wild blossoms, and he unwittingly invaded the domain of a fairy serpent that coiled around him, held him tightly, and railed at him for having entered his garden. The man excused himself, saying that he came merely to get a few flowers for his daughters, who would be sorely disappointed were he to go home without his usual gift to them. The snake asked him the number, the names, and the ages of his daughters and then refused to let him go unless he promised one of them in marriage to him. The poor man tried every argument he could think of to induce the snake to release him upon easier terms, but the reptile would accept no other ransom. At last the father, dreading greater evil for his daughters should they be deprived of his protection, gave the required promise and went home. He could eat no supper, however, for he knew the power of fairies to afflict those who offend them, and he was full of anxiety concerning the misfortunes that would overwhelm his whole family should the contract be disregarded. The tale is an obviously ATU 425C tale although it has some interesting variations. The one I find most intriguing are the wasps that come to press the girl into leaving her home after she has made the promise to marry the fairy serpent. Reading, Translating, Rewriting: Angela Carter's Translational Poetics (Series in Fairy-Tale Studies) by Martine Hennard Dutheil de la Rochère is the third November release from Wayne State University Press in their Series in Fairy-Tale Studies. As anyone knows who has been reading about fairy tales for a while, Angela Carter is one of the most popular subjects for modern literary fairy tale scholarship. Carter both translated and rewrote fairy tales and is embraced, deservedly so, by the literary realm of academia as well as folklorists. Carter's The Bloody Chamber is essential fairy tale reading once you reach an acceptable age for it. It is not literature suitable for the preteen and below set, perhaps not even some teenagers I know. If you read this book, you will want to be familiar with both The Bloody Chamber: And Other Stories (Penguin Ink) and Little Red Riding Hood, Cinderella, and Other Classic Fairy Tales of Charles Perrault (Penguin Classics) . I also recommend Angela Carter's Book of Fairy Tales while we are here, but it's not as much of a companion to this study as the other two books. The Book of Fairy Tales is out of print in the US but is easily found used in this edition or earlier ones usually under the Virago Fairy Tales title. I've owned a few editions of it over the years. In translating Charles Perrault's seventeenth-century Histoires ou contes du temps passé, avec des Moralités into English, Angela Carter worked to modernize the language and message of the tales before rewriting many of them for her own famous collection of fairy tales for adults, The Bloody Chamber, published two years later. In Reading, Translating, Rewriting: Angela Carter's Translational Poetics, author Martine Hennard Dutheil de la Rochère delves into Carter's The Fairy Tales of Charles Perrault (1977) to illustrate that this translation project had a significant impact on Carter's own writing practice. Hennard combines close analyses of both texts with an attention to Carter's active role in the translation and composition process to explore this previously unstudied aspect of Carter's work. She further uncovers the role of female fairy-tale writers and folktales associated with the Grimms' Kinder- und Hausmärchen in the rewriting process, unlocking new doors to The Bloody Chamber. Hennard begins by considering the editorial evolution of The Fairy Tales of Charles Perrault from 1977 to the present day, as Perrault's tales have been rediscovered and repurposed. In the chapters that follow, she examines specific linkages between Carter's Perrault translation and The Bloody Chamber, including targeted analysis of the stories of Red Riding Hood, Bluebeard, Puss-in-Boots, Beauty and the Beast, Sleeping Beauty, and Cinderella. Hennard demonstrates how, even before The Bloody Chamber, Carter intervened in the fairy-tale debate of the late 1970s by reclaiming Perrault for feminist readers when she discovered that the morals of his worldly tales lent themselves to her own materialist and feminist goals. Hennard argues that The Bloody Chamber can therefore be seen as the continuation of and counterpoint to The Fairy Tales of Charles Perrault, as it explores the potential of the familiar stories for alternative retellings. While the critical consensus reads into Carter an imperative to subvert classic fairy tales, the book shows that Carter valued in Perrault a practical educator as well as a proto-folklorist and went on to respond to more hidden aspects of his texts in her rewritings. Reading, Translating, Rewriting is informative reading for students and teachers of fairy-tale studies and translation studies. Martine Hennard Dutheil de la Rochère is professor of English and comparative literature at the University of Lausanne, Switzerland. Her most recent book is Des Fata aux fées: regards croisés de l'Antiquité à nos jours. I received a review copy of this book, but I haven't had time to do more than crack it open briefly. Each chapter is devoted to a different fairy tale that Carter both translated and rewrote from Perrault, so it is useful for those wanting to write a paper on a single Carter story, such as The Company of Wolves or The Tiger's Bride, two common favorites for analysis, along with The Bloody Chamber itself. The Thief (Attolia) by Megan Whalen Turner is on sale in ebook format TODAY ONLY for $1.99. It's usually in the $6 range. This book--which starts a series--is not fairy tale based although Whalen definitely draws inspiration from various mythologies. However, this series is one of those that--for me--ruins you for other books until time passes and you forget a little just how special it was to you. It provides an intense literary high. Not everyone has that reaction, but I know many who have said similar, a larger majority than usual, especially for a lesser known non-blockbuster book made into a box office breaking movie adaptation. Not that this book is obscure--it received a Newbery Honor Medal. And I do not want it made into a movie. Never, please. Anyway, I adore it and had to share. I first read the series seven years ago--I came to it late--when I returned from my first trip to Europe, very jet lagged, life lagged, and headed directly into the holidays. I remember reading it far into the night when I couldn't sleep and was trying to process the previous three weeks of adventures in foreign lands. Whalen is a master storyteller and wordsmith. You'd enjoy her stories even if they weren't so exquisitely written. But her prose is lovely all in itself, too. Combined it's the work of a master. Nothing is overdone and not a word is out of place in this auspicious debut," wrote Kirkus in a starred review of Instead of Three Wishes, the first book by Megan Whalen Turner. Her second book more than fulfills that promise. The king's scholar, the magus, believes he knows the site of an ancient treasure. To attain it for his king, he needs a skillful thief, and he selects Gen from the king's prison. The magus is interested only in the theif's abilities. What Gen is interested in is anyone's guess. Their journey toward the treasure is both dangerous and difficult, lightened only imperceptibly by the tales they tell of the old gods and goddesses. These books, especially the rest in the series, are really better suited to older readers than the middle school implied. Overall, the content is safe enough but the nuances are best appreciated by older readers. A shocking event in the second book is a little rough, but not too much for the average preteen today. The third, The King of Attolia , is my favorite for this reason and because it builds so well on the previous titles. In other words, these books are ageless. "The Enchanted Tsarévich" is an ATU 425C: Beauty and the Beast tale from Russia. This tale also describes the beast as a snake, but a winged one, perhaps more of a dragon image although snake is used in the translation by Leonard Magnus from Alexander Afanasyev. It is included in Beauty and the Beast Tales From Around the World . The merchant was frightened, fell on his knees and besought pardon. Darkness now came on, and the merchant’s daughter went into the bedroom, wishing to lie down and sleep. Then a boisterous wind rustled round and the three- headed snake appeared in front of her. So the fair maiden put the bed outside the door and herself lay on the bedstead. She awoke in the morning, and again in the entire house there was not a single soul to be seen. And it all went well with her. Whatever she wished for appeared on the spot. She then laid it next to her bedstead, and the night went by, and the maiden awoke, and again there was never a soul in the palace. The merchant’s daughter was fearfully afraid of lying on a single bed with such a formless monster. But she could not help herself, so she strengthened her heart and lay down with him. I would love to see some illustrators' images of this "formless, winged snake with three heads," wouldn't you? There are perhaps some out there, but I didn't find any with a cursory search. Ravensburger Labyrinth is another Ravensburger game on sale today and it is very well reviewed. It also looks unique and fun. Since it deals with mythology, I thought I'd share it, too. I am looking forward to trying it out with my nephew and niece (the ones old enough to play) during the holidays. My niece went through her mythology fascination stage a few years ago and my nephew is the right age to perhaps get interested himself, especially since so many sports teams reference myth, like my hometown Tennessee Titans. 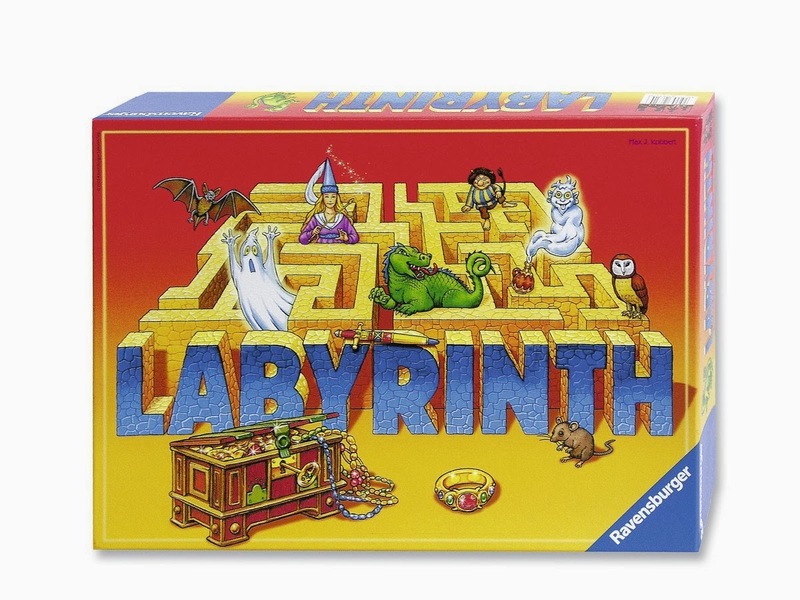 Labyrinth from Ravensburger is a shifting maze board game for players ages 8 and up. Race for treasures in the moving maze and try to foil your opponents! Players strategically shift the walls of the Labyrinth’s maze to find the perfect route to their treasure card. The first player to collect all their treasures and return to the starting point wins. 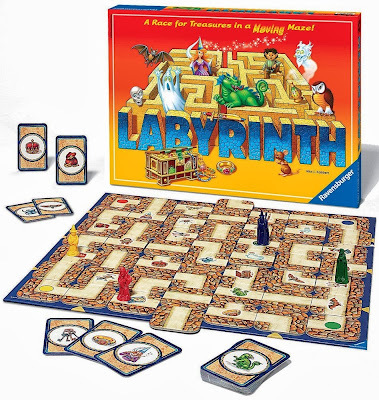 A family-friendly board game for ages 8 and up, Labyrinth can be played with various levels of strategy and is a great game to play with children who are just becoming more advanced with strategic playing patterns, as well as a stimulating game for adults. The game board moves as players create the pathways they need to travel through the maze and collect their treasures which can be quickly altered when opponents take their turn. Since the game requires no reading and game rules are straightforward and easy to explain, young children are able to play alongside older siblings and adults. Thanks to the constantly moving game board that creates a new game every time it’s played and the many strategic options to foil your opponents, Labyrinth captures the attention of a wide range of ages. Immersive, hands-on game play promotes concentration, hand-eye coordination as well as social interaction which makes playtime more educational for the younger ones but also entertaining for older members of the family. Labyrinth provides a fully-engaging, interactive gaming experience with an element of excitement as each game play differs depending on the number of players involved and the way players react to the challenge of the moving game board in unpredictable ways.